Have you ever tried to put your design style into words? It can be tricky! In fact, I’ve spent an embarrassing amount of time trying to define my style over the last few weeks. Not just for fun though, it’s actually extremely helpful to put some words around your style as you decorate your home. It helps bring clarity when you are shopping and making decisions, and can give the whole house a cohesive feel over time. 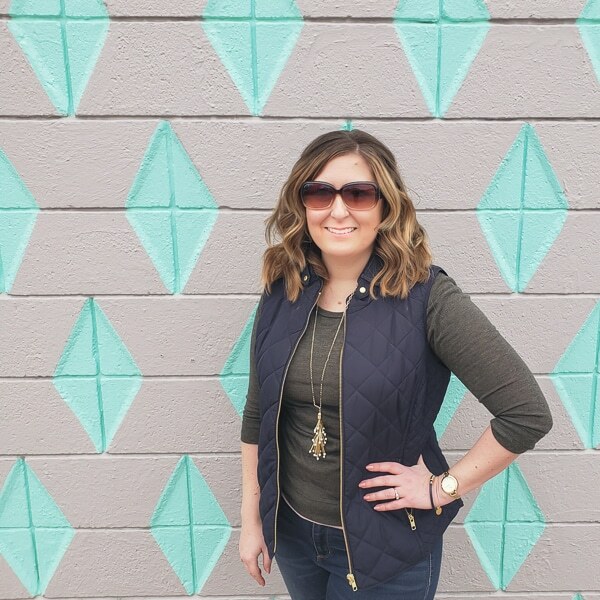 I had a deadline for this task because I joined a group of bloggers that do “My Home Style” tours, hosted by my sweet friend Stephanie from Casa Watkins Living. Thanks so much for visiting if you are coming from Casa Watkins or from Lovely, Etc! Clicking through all the posts in this tour is a great way to find your own style, because each blogger has selected their own three words to define themselves. You can either find your style soulmate and use their three words, or make notes as you go through and combine several together to really capture the unique feel you’d like your home to have. All the links are at the bottom of the post. This round of tours is especially fun because everyone is showing before and after photos. 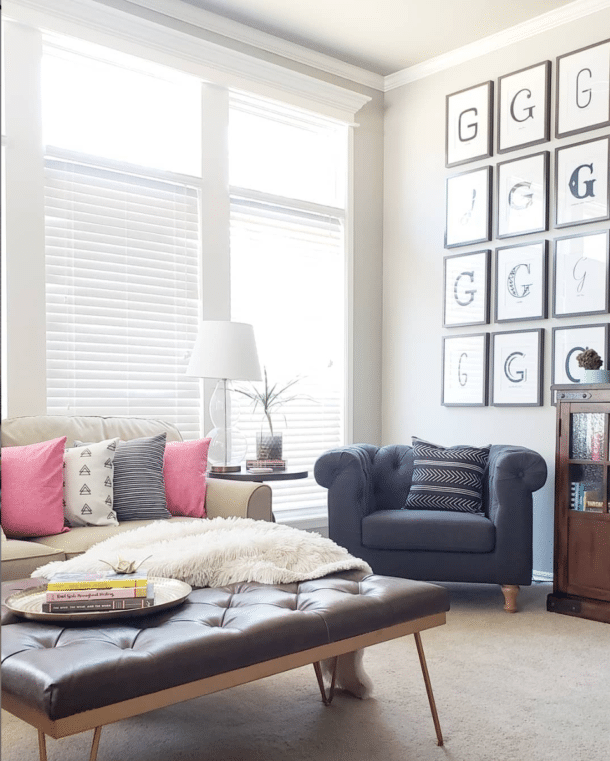 Style evolves over time, and it’s interesting and inspiring to go back in time and see what the same room looked like before each person really found their own style that they love. I’ve got tons more to say about how I found my style and how you can find yours, but we’ll do that another day. Otherwise this post will become a full length novel before we even get to any pictures. Just know it took lots of thought, feedback from others, and googling, but I found my three words! Since each of those words can bring different things to mind, I made up my own definition of what they mean to me. Ideally, I would have figured out this style before I started decorating the house, but you can definitely see it in the photos of all my recent spaces. Going forward, I know I’m going to make way fewer mistakes when shopping because I have an ultimate cohesive style goal for the house. The first room where this style started to come to life was the pantry. It was the first time I participated in the One Room Challenge, and that process of decorating a room alongside legit designers made me come alive and let go of so much decision-making fear. 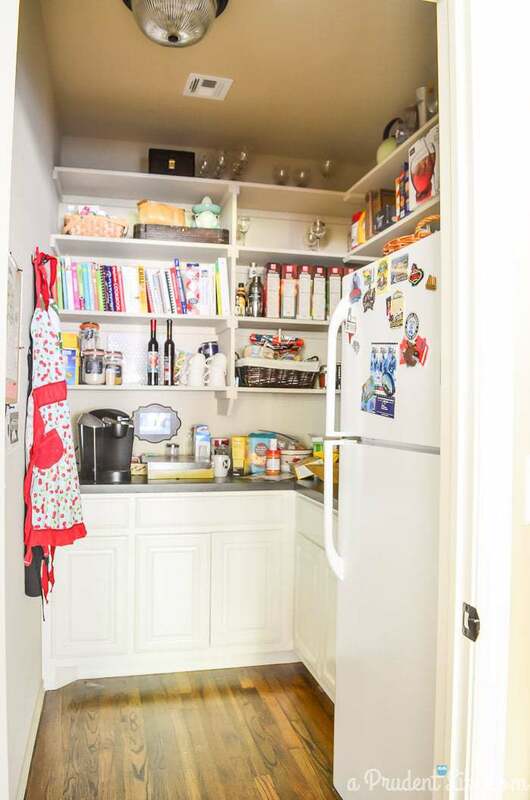 Before, the pantry was an amazing space, yet completely suburban vanilla. I picked it to redo because it was small and seemed less scary than tackling a more public room. It was the perfect place to experiment! 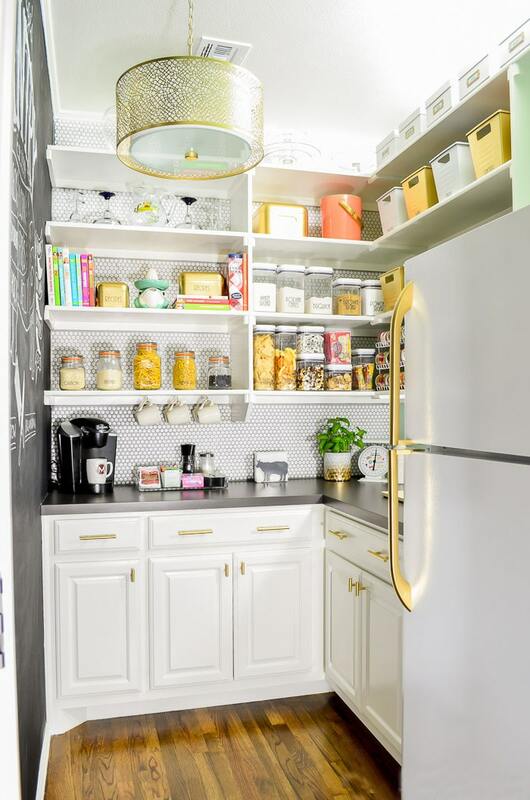 I went all-in with gold accents in the pantry and I love how much glam they add to the previously boring space. The black wall, white penny tile, and light fixture all helped contribute to the Modern Industrial Glam look. You can find more photos and info about the pantry makeover here. The tiniest spot in our house is another great example of my style progression. The entryway from our garage was bland and dysfunctional. But the after has miles of style! 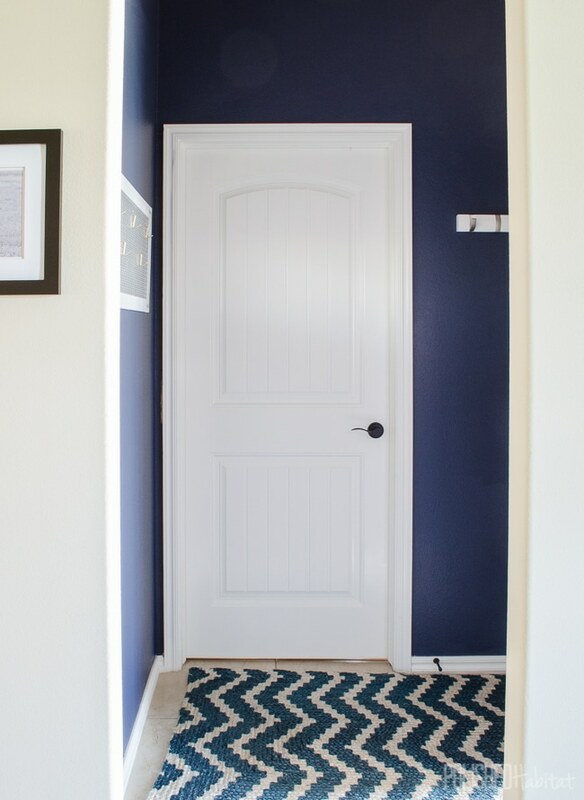 The blend of dark walls with white adds some industrial drama, and the rug has a modern geometric pattern. My favorite piece in the room is the industrial glam coat rack. I made it out of a piece of metal from the hardware store! In the winter, it holds hats, scarves, and gloves. 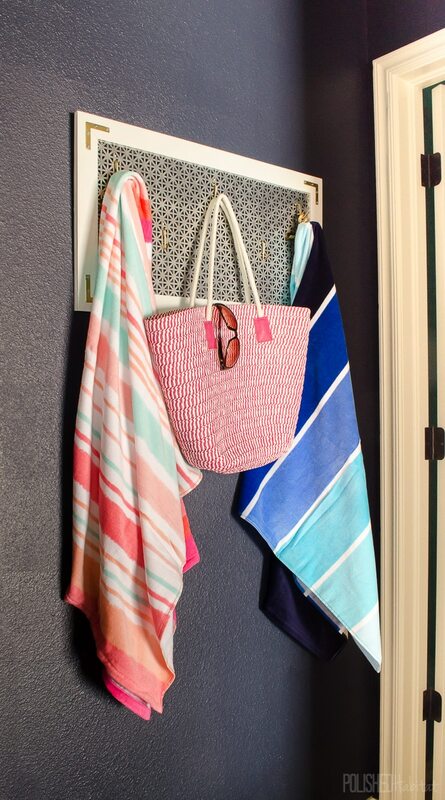 In the summer, it’s perfect for pool towels and the beach bag. 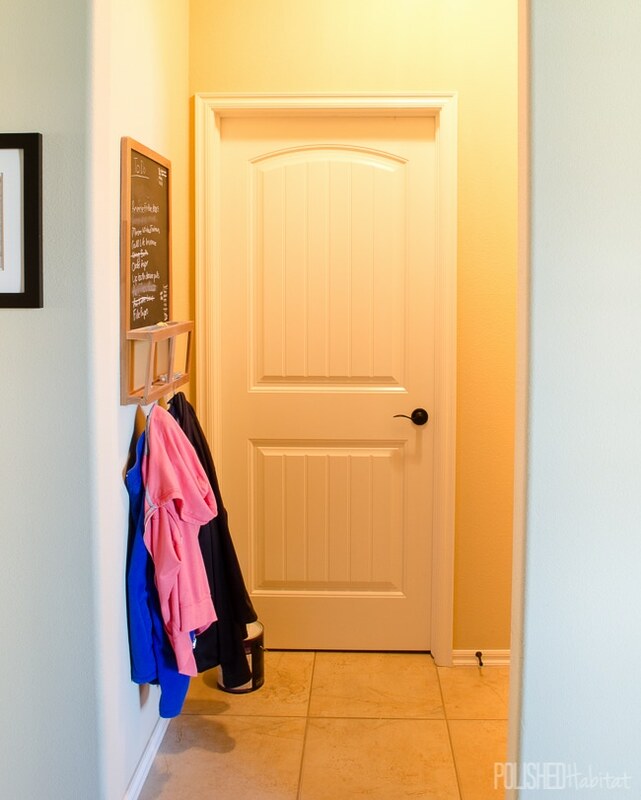 More details on this mini-mudroom can be found here. 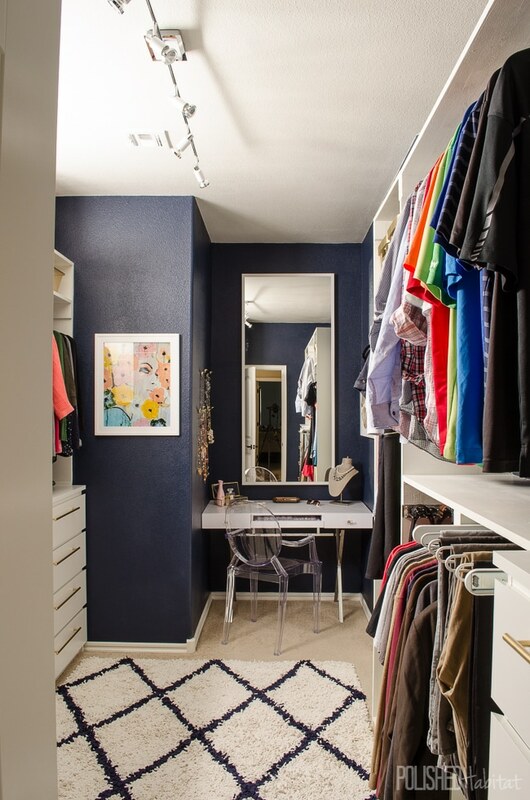 Our master closet had a similar, but much larger scale makeover last year. Before, it was completely frightening and again, beige on beige on beige. We solved both the style and functional issues! I was even able to sneak industrial details into the closet by mounting the DIY Clutch Holders with exposed screws and washers. 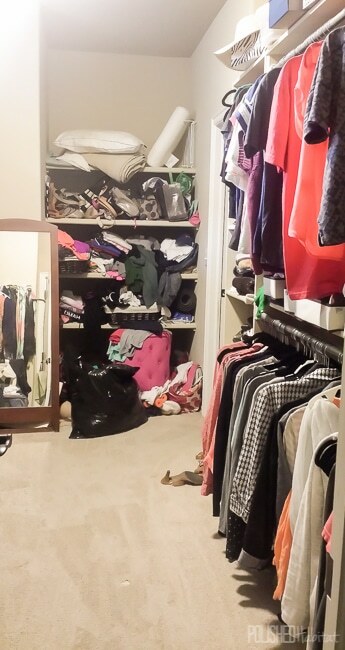 For more photos and sources for the master closet, click here. All of those spaces were like the warm-up rounds as I continued to define my style. I kept getting braver in going for things that I loved, and it all paid off when it was time to finally give ourselves a real master bedroom. I wanted something completely opposite of the generic space we had been living in. We have been spending more time in downtown Tulsa, which is in a mid-revitalization in the most amazing way. I realized one afternoon that what I loved about our downtown was the blend of over the top oil-money glamour from the 1920s-1930s, gorgeous art deco, urban graffiti, and new very modern structures. None of it should work together, but it all flows and creates such a feeling of both modern life and history. I used all those things from downtown as inspiration for our bedroom. And in the after you can definitely pick out the Modern, Industrial, and Glam details. I was even able to work in my inspiration photos from Tulsa around the TV in a gallery wall. Gotta love free art! All the bedroom photos and source details are here. Those spaces are the ones that we were able to finish as full room makeovers during different rounds of the One Room Challenge, but like most of you, we can’t just redo entire rooms all the time. Turning the full house into my style is going to be an evolution over a few years. Our living room has been SLOWLY getting Modern Industrial Glam accessories. Even though we can’t tackle the whole room, adding my style in smaller ways has been a great way to enjoy the space now. Here’s what it looked like before. Why, oh why, is there a teeny tiny picture hung above that chair!?! To progress to a Modern Industrial Glam look, we’ve switched the walls from beige to griege. I also add both gold and modern elements as I find pieces that I love. I can’t wait to add a couch with more personality, swap the rug, and ditch the carpet. 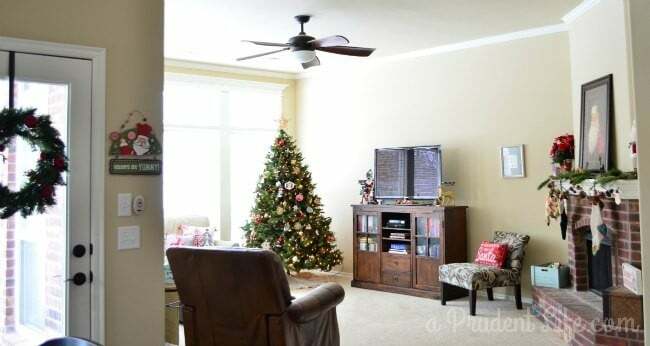 But, I wanted to show that you can still bring in lots of personality and style without changing the layout or expensive pieces of furniture in a room. 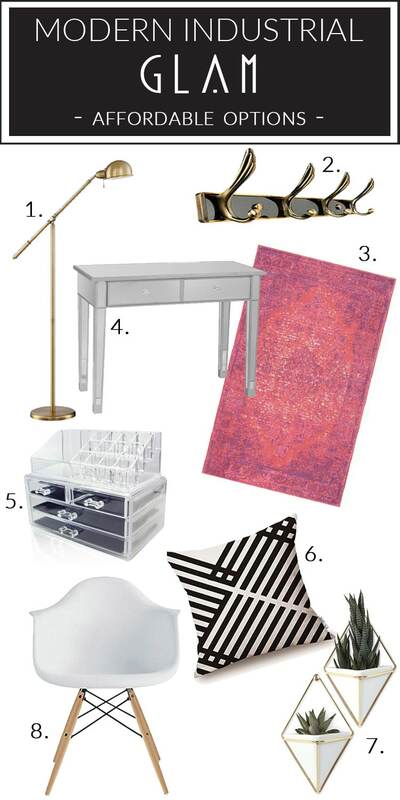 On that note, I did some virtual shopping to source out some really great accent pieces that totally fit my Modern Industrial Glam style in case the style speaks to you. Every one of them can be bought at amazing prices from Amazon! Hello, free shipping! 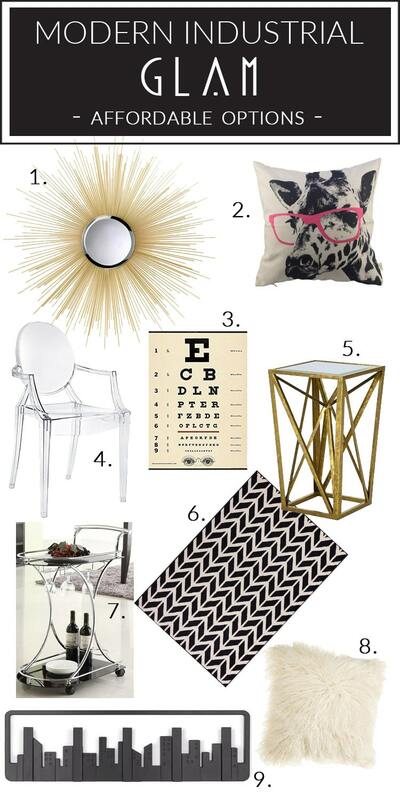 That eye chart poster is under $10 for a good size piece of art – what a deal! 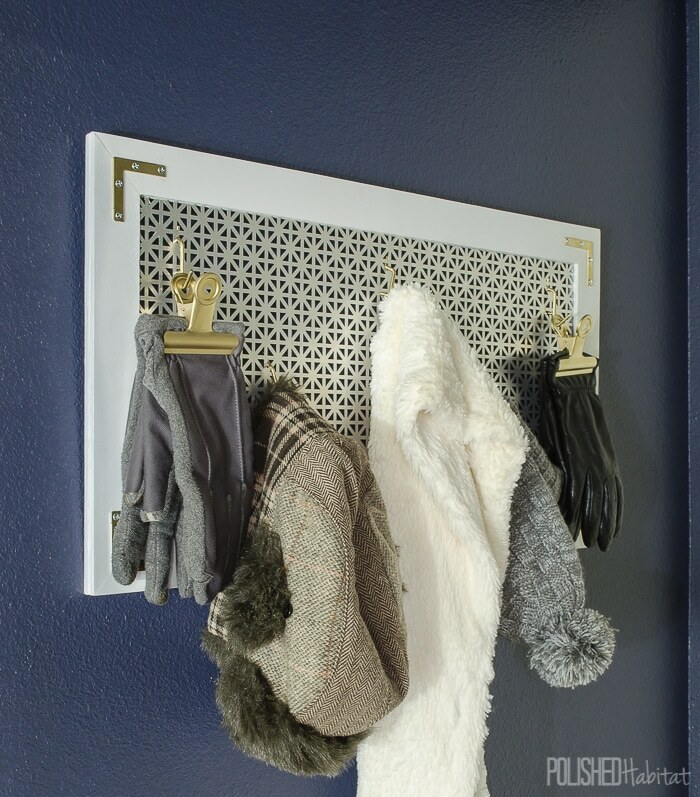 I’ve got it in my Amazon cart right now, along with the gorgeous deco coat rack. I think it would be perfect in the bathroom for robes! I would have already placed my order, but I’m trying to decide if I “need” to pick up that black and white geometric rug as well. It’s a bigger investment, but at the same time, a total steal for a stylish 8 x 10 ft rug. I think it might be the perfect next step in the living room transformation! 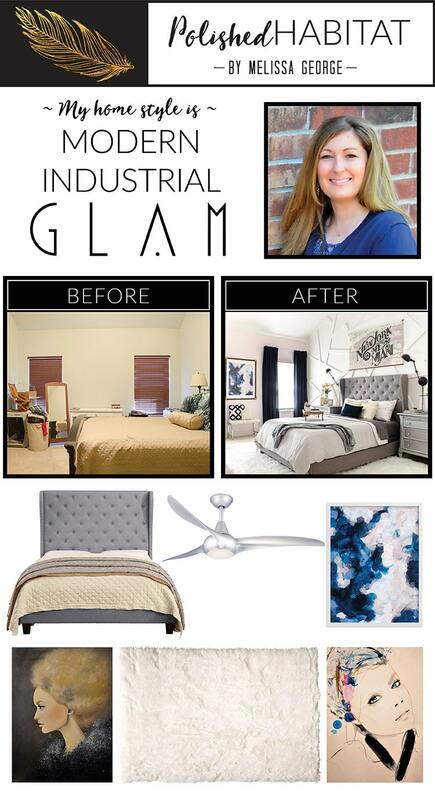 Now that you’ve seen my Modern Industrial Glam style, make sure you click over to visit the next house on the list, which happens to be my great friend Angela from Blue i Style. You can also find the entire list of participating blogs below! Thanks, Ariel! Sometimes I forget that there are amazing options on Amazon. Your style is absolutely beautiful! I love the combination of glam and industrial. Stunning spaces! WOW! 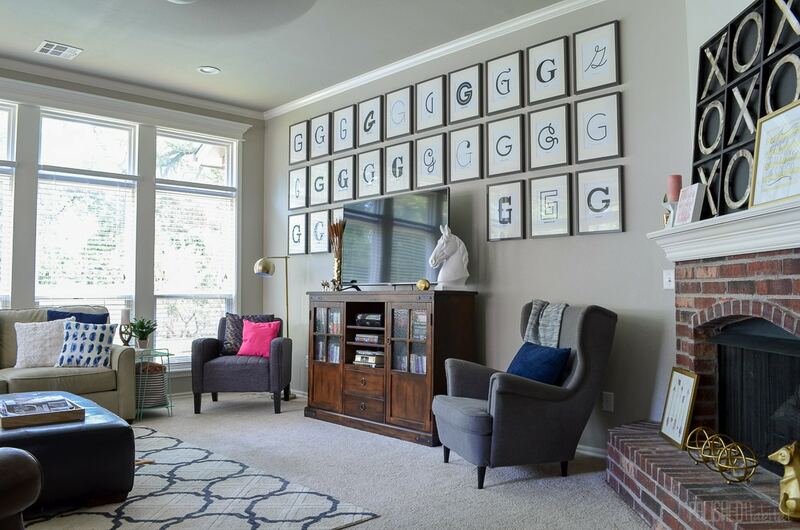 i just love how much personality has been added to your home to make it beautifully yours! Thanks so much, Cassie! I don’t know when I got afraid to make bold decisions because our first house had a bright yellow, Hawaii themed room (I blame Trading Spaces!). I’m just glad I got over it and am back to having fun with the decor. This is so beautiful, Melissa! 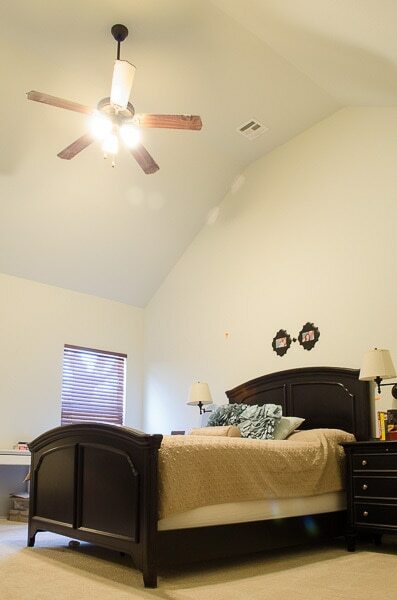 I absolutely adore your bedroom transformation! I love absolutely every single space!! I’m moving in!!! P.S. I pinned and stumbled! Thank you so much!! You can move right in – I’ll charge you some rent to help fund the rest of the rooms that need to be tackled! Ugh! 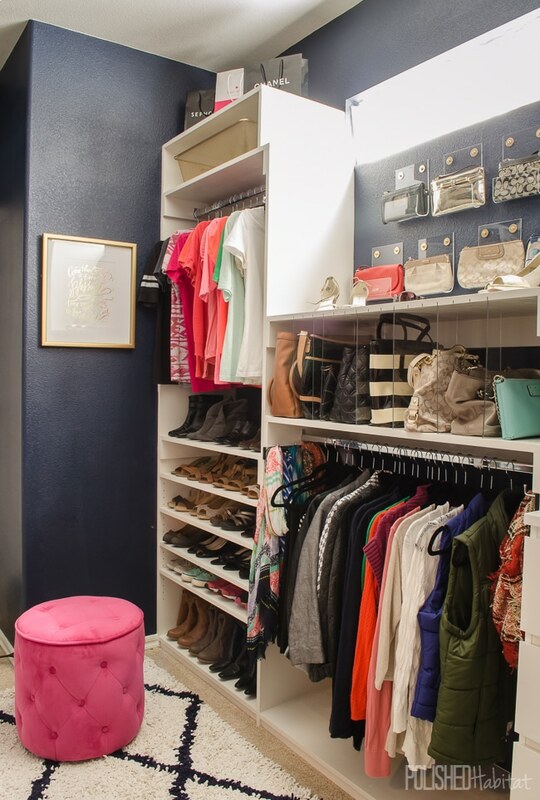 Closets are a ton of work, but the payoff is totally worth it. Just remember the pain is temporary! 🙂 Can’t wait to see what you do! Wow! 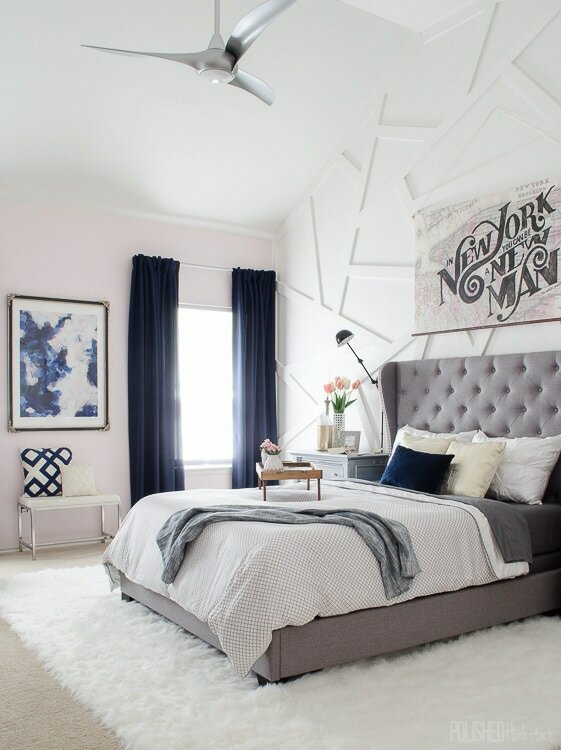 Everything looks great….I LOVE that feature wall in the bedroom–it’s perfect with the high ceiling! Thank you, Gretchen! Putting up the wall was scary because it’s pretty permanent, but it was so worth it! Absolutely gorgeous Melissa!!!!! I love seeing all the transformations and my fav, your pantry!!!! Love it all and adore the shopping guide. Thank you, Stephanie! I had fun pulling together the shopping guide and trying to find cool products that weren’t outrageously priced! Hmm, a trip to the UK to organize a gorgeous house? I’ll be on the next flight out! Melissa! Awesome, seeing all your talent and hard work in one place! 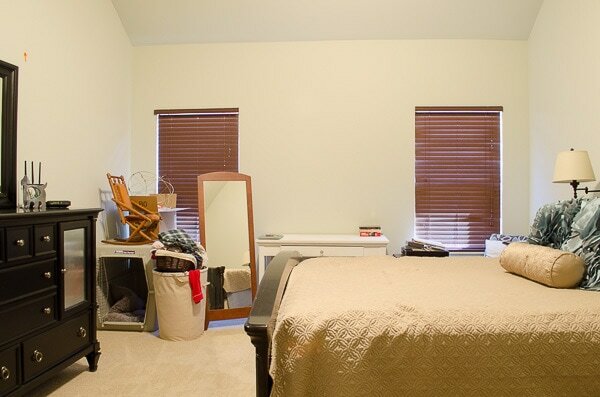 I am missing the incredibly modern, industrial, glam GARAGE and office (oh, yes, the guest bedroom as well! 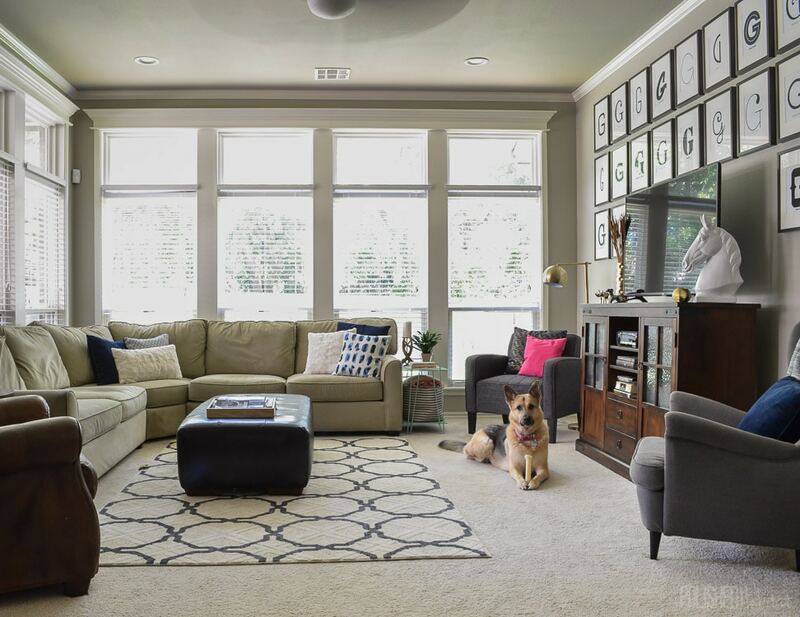 )….oh my, you have basically redone your entire home in one year! WOW! When do you sleep?? 🙂 You are an inspiration! Thanks for sharing!!!! Thank you, Sarah! But, trust me, we have lots of spaces in the house that still look like the before photos from this post! It’s definetely a long process to get a whole house looking like your style, but progress over perfection, right? Wowzers lady, your room makeovers keep getting better and better! I would gladly move into your gorgeous walk-in closet 😉 XO! Your style is so distinctive! I love it and you described your style so perfectly! WOW, Melissa. 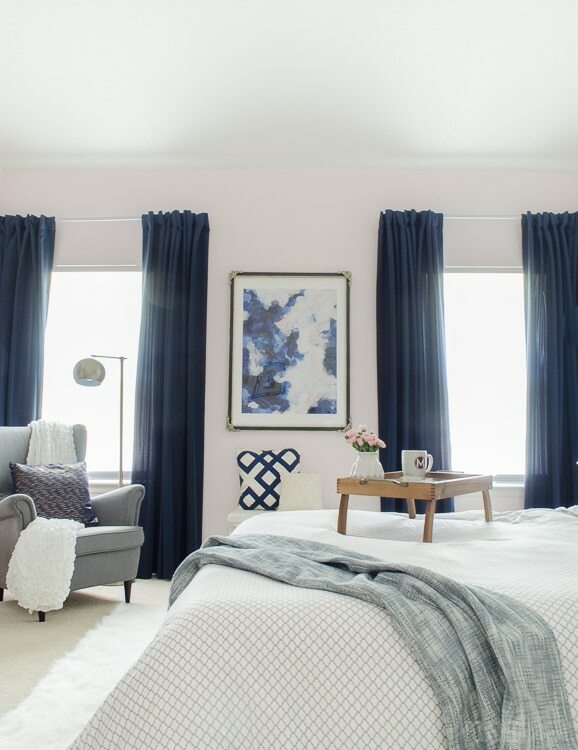 Your Master bedroom is utterly stunning! That feature wall behind your bed is genius. So sophisticated and full of personality. Your rooms are beautiful, each and every one! Everything is beautiful! The bedroom is so serene. I love the pantry and closet organization. A house should not feel chaotic. You have turned your home into a retreat. Thank you, Alita! I can’t wait until the rest of the house is as retreat-like and un-chaotic. But, I’m thrilled I can retreat into the bedroom for now! Thank you, Karen! Intentional should have been one of my words! I LOVE thinking about how the room is going to work, not just how it will look. Your changes in decor are amazing and so interesting and fresh. My favorite part is your closet. That lucite chair is beautiful, and everything looks so great and organized. It must be a good way to begin a hectic day. It all looks so different from your “before” pictures. Isn’t it amazing how our tastes change from time to time. Here I am 75 and would love to change all of this old traditional and mixup my antiques and some more modern and new ideas. Thank you, Melissa, for your inspiration. Thank you so much, Nancy. It totally made my night that the post was inspiring to you! I LOVE the idea of mixing in some modern pieces with your antiques. My dream would be to live in an old house with huge, elaborate original moldings and fireplaces, but to furnish it with more modern decor. I think both styles can work together beautifully! Oh my gosh Melissa! I love love love your space! Seriously! The G wall is amazing and those gold handles on your fridge, awesome! I love your glove/hat rack too. Pinning!! Your style speaks to me Melissa! I’ve loved watching the transformations take place as you tackle each room and turn them into your signature look. (Gosh, I also love the changes you’ve made to your blog too!) You’ve been so much fun to follow these last couple of years. Can’t wait to see what you do next. What a huge change! And of course your house looks much more stunning now. Your bedroom is really something to die for. Well I’m speechless, everything is perfect! !